In Australia, we often take sanitation and hygiene standards for granted, especially in our hospitals. 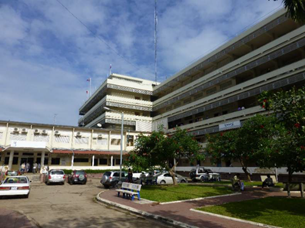 However, it was discovered that at the Khmer Soviet Friendship Hospital (known locally as 'the Russian Hospital') in Phnom Penh, Cambodia, it's a very different situation. Government funding is not available for the work required to provide minimum sanitation hygiene in the wards and corridors of the buildings throughout the complex, which was built for 500 patients but usually has more than 620 patients, 1000 staff and many visitors. This project resulted from a request for assistance to the poorest of the public hospitals in the country. Health professionals know that simple, effective hand washing is the first step to stop the spread of infection. The project benefits for the patients, staff and visitors in this hospital will be measured by the lower number of reported infections and reduced hospital bed days. In December 2016, Applecross Rotarians Dr and Past President Barry Mendelawitz and Past District Governor John Kevan visited the hospital to confirm the need for the new equipment, meet with the hospital director and infection control staff and prepare a detailed project plan to address hygiene issues at the hospital. The Director of the hospital fully supports the project. 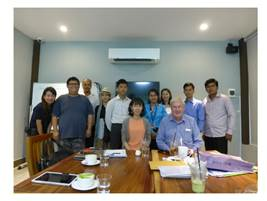 They met members of the Rotary Club of Phnom Penh Metro, who agreed that the club would be the host club for this international project. The Applecross Rotary members also met with suppliers and contractors to obtain the costs of materials and labour. 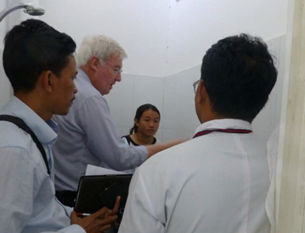 Toilet inspection with PDG John Kevan, interpreter Phong, a Contractor and the head nurse. 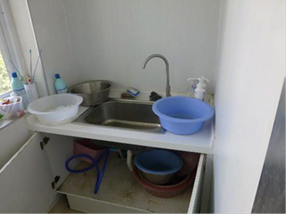 These are the existing instrument washing facilities outside an operating theatre - very different to what you might find at an Australian hospital. The reports of extremely high death rates at the hospital encouraged the team and the Rotary Club of Applecross to embrace this as its next international project. High mortality rates in the hospital due to the lack of hand washing facilities and ineffective hand washing by staff, patients and visitors, has increased the transmission of infectious diseases, resulting in longer hospital time, slower recovery and patient deaths. The key elements of the project are to provide hand basins, elbow operated auto stop taps, soap dispensers, towel dispensers, associated plumbing and a hygiene education program. 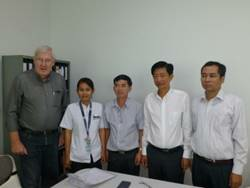 In May 2017, the Rotary Club of Applecross in Western Australia, was notified of a Rotary Foundation Global Grant for US$ 47,000 to install hand basins and other equipment at the Russian Hospital in Phnom Penh, Cambodia, subject to the Club securing a significant portion of the funding for the project. Past District Governor John Kevan and other Applecross Rotarians sought support from Rotary Clubs and Districts throughout Western Australia. Several Rotary Clubs contributed a total of A$ 21,500, the Rotary Districts in WA contributed another US$ 15,000, and the balance was from the International Rotary Foundation. Past District Governor John Kevan with the Hospital Director and senior infection control staff, confirming access to the hospital to start the installation works. In June 2017 Past District Governor John Kevan visited the hospital to meet with the Hospital staff, contractors, suppliers and the local project host Rotary Club. 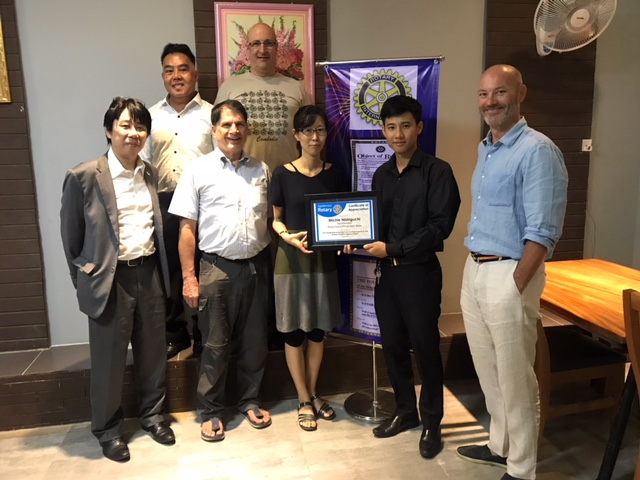 Members of the Rotary Club of Phnom Penh Metro and guests at their regular Tuesday meeting, celebrating the start of the project and witnessing the signing of the installation contract. President Michie Nishiguchi, Rotary Club of Phnom Penh Metro, and Nita Mean, Infection Control Coordinator, at the first new installation of a hand basin and facilities at the hospital. The first installation of hand basins, elbow operated taps, liquid soap and paper towel dispensers in the hospital wards occurred on 16 June 2017. Over three hundred installations will be completed, using equipment and labour procured locally. Sample of the laminated poster placed above every hand basin. A total of 400 posters, all in Khmer will also be placed around the hospital corridors, elevators and stairways. 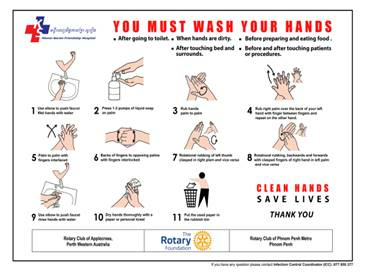 An essential part of the project is training, with extensive information on hand washing procedures, so a large poster showing the correct ways to wash hands will be placed on the wall above every basin. A training program for all hospital staff and consultants will be held in September, to demonstrate and reinforce the message of ‘Clean Hands – Saves Lives’. Sinks, soap and paper towels will be installed at the entrances to the hospital so that all visitors can also wash their hands before entering the wards. Large troughs will be installed in corridors so that visitors can wash their hands and the food containers that they bring to the hospital to feed the patients. Increased washing facilities in three surgical support areas will also be provided. These new initiatives will directly benefit the thousands of patients and visitors using the hospital each year, by reducing the potential risk of infection and the transmission of diseases. The Director and senior staff at the hospital are committed to funding the supply of liquid soap and paper towels, and conduct regular training, to sustain the initiative of increasing awareness by everyone in the hospital, to wash their hands. Tool boxes for maintaining the new equipment and other facilities, as well as training, will be provided to the maintenance team. A photo of the presentation of the certificate from Rotary Club of Applecross to PP Michie Nishaguchi, who was the President of the RC Phnom Penh Metro, Cambodia, at the completion of the Russian Hospital Hygiene Project. The President is surrounded by Club members..